The notorious burrower, the mole, is perhaps one of the most secretive and mysterious creatures that persistently coexists with humans. While many people will see freshly-turned piles of dirt, indicating one of the little tunnelers has been near, very few have actually seen a mole. The reason for this is that moles are no casual diggers - they typically spend most of their lives below ground. So what happens when they DO show themselves aboveground? One little mole was seen above ground in Surrey by a concerned onlooker, who reported the creature to Wildlife Aid. Moles are not well-adapted to stay above ground for very long, as they have poor eyesight and a less-than-stellar sense of smell. 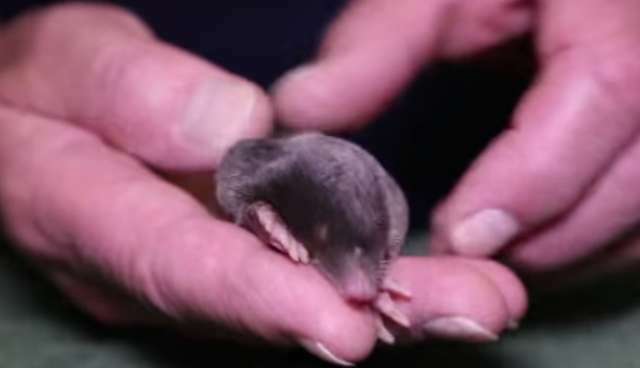 When the mole was taken to Wildlife Aid's hospital, it became clear to the wildlife rescue workers that the little guy had only recently become independent and left his mom. Whenever moles leave their mothers, they can occasionally be found above the soil, trying to find a new home. The young mole was a tad camera-shy, doing his best to wiggle into his nest of grass. Grass is a little more tricky to dig into than dirt, unfortunately. The workers kept the mole for a bit of observation, to ensure the creature didn't have any injuries. The little mole was a tad peckish, and didn't seem very interested in the tasty earthworms which were given to him as a snack. Luckily, the mole had no injuries, so his return to the wild was imminent. "It's a general rule, with all wildlife, if they don't need to stay for any treatment, we always try to get them out as soon as possible," says Cristina, one of the veterinary surgeons at Wildlife Aid. "But particularly with moles, they don't do well in captivity, so it was even more important to get (him) out." The team took the mole back to where he was spotted and dug a hole in the soft ground to help get the little fellow started on his new home. If you see a mole above ground, it is generally best to leave it alone and give it a chance to burrow back under the soil, but if you sense the animal might be hurt, call your local wildlife rescue center. Moles are unfortunately often considered to be pests, as they dig up yards and gardens. Many moles are killed by traps, as that is often seen as the only way to get rid of them. However, moles can be very helpful, as they aerate soil with their digging and eat pests that are harmful to plant roots. If you aren't a fan of moles in your yard, castor oil is a more natural and friendly method for deterring the creatures.